A couple of years ago, a friend opened a day spa in our neighborhood. I thought it might be fun to bartend the grand opening party for them (I have no professional training, but have logged plenty of observation time in my day). The night went off without a hitch, and as a thank you, I got to keep all the leftover alcohol. This included a nearly-full keg of some really pristine microbrew from Washington State. While bottles of liquor could be conveniently shelved for later consumption, I did not have the means to store the keg for very long, nor keep it cold for more than a night. Rather than commit a party foul that would brand me for life with the man-law equivalent of a scarlet letter, I summoned the troops (it’s such a warm feeling to know that you’ve got friends willing to drop everything to help you polish off a keg). The next afternoon, we held a grand opening party of our own on my back patio. I was bartended-out so the job naturally fell to my understudy, my then 3-year-old Marcus. We all pitched in to show him how to prime the pump, work the dispenser and tilt the cup to minimize foam. Before long, he was slinging beers around the yard like an old pro, and padding his Lego slush fund quite nicely for his efforts. One winter my buddy invited me up to Mammoth Mountain for a weekend of skiing. He was bringing his two nieces and suggested I bring Marcus along so that the kids could all take ski lessons while the grownups hit the slopes. 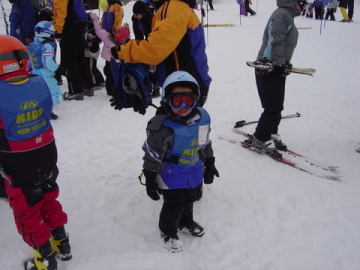 It wasn’t until we got to the lodge that we found out ski lessons were only for kids 4 and above. That threw a major soggy nasty wrench into our plans, since Marcus was still 3 at the time. Dilemma. We came too far for me to spend the day making snowmen 6 hours from home. But could I make Marcus lie? And I meant that in the technical sense (Moral issues? What moral issues? Where… underneath that 10 feet of packed powder out there?). How could I ensure that Marcus maintain the charade throughout the afternoon? Think, Dad, Think! That’s all the time we had to practice before the instructor gathered all the kids into one group. Some hands went up. My heart sank. I only prepared him for the verbal interrogation. They must’ve orchestrated this to catch bad parents like me. Holy crap! They’re good! I bet they catch a lot of otherwise well-coached kids with this reflex trick. Marcus stayed cool. Or he wasn’t paying attention. Either way, the desired net effect was achieved. Marcus’ hand shot up! I heaved a not-guilty-verdict-style sigh of relief. YES!!! My buddy and I clomped out of that ski lodge as fast as our boots could take us and never looked back. I was so proud of Marcus. Lying is bad. Understanding and properly applying time zone adjustments is just plain smart.